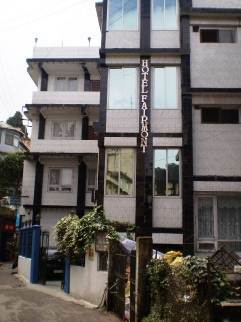 Hotel Fairmont is a budget hotel in Darjeeling offering nice rooms and amenities in a very convenient location. The hotel is located on Gandhi road and right opposite to the four star hotel Viceroy. The Chowrasta Mall is about 5-6 minutes walk from here. Vehicles pass by the hotel and the road at this point is quite narrow. The Clubside Taxi Stand (across Gandhi Road Police Point) is only 3 minutes walk towards the Mall. From outside, the entire hotel is tiled with white and light grey tiles having black borders. This building was built in the 1990s and looks quite new. There is an iron grill gate in front followed by a small private car park and then the main entrance door of the hotel. The reception area is in the ground floor and right across the front door. The staff at the reception are quite nice and speak English. The hotel was owned by Mr. B.P. Mistry, a local. Now his son Jeff Mistry has taken over. Jeff is a cordial and a very polished man. Next to the reception area there is a lounge that has several sofa sets and a center table. The hotel has 21 rooms of different categories. There are Super Deluxe rooms which are located on the top floor and have nice views of the mountains. The are also standard double, three bedded and four bedded rooms. The rooms are carpeted and have televisions with standard cable channels and intercom phones. 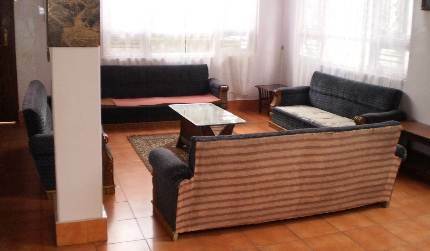 There are cushioned chairs or sofas laid out on one side of the rooms with a small table where you can relax and have your tea. 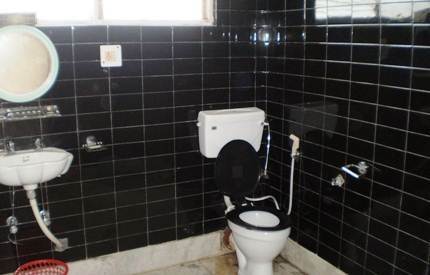 The bathrooms are standard and are of western style. There are geysers which operate when power is available. While the hotel has backup power, that only supports a few lights in the rooms and other essential electricals in the hotel. The backup power is made available only in the evening. There are also emergency lights provided in the rooms in case of power failures which is quite common in Darjeeling. The hotel also provides portable room heaters or blowers in the rooms during the winter season. There is a new and spacious multi cuisine restaurant which has come up in Fairmont Hotel offering Indian, Chinese and Continental dishes. The restaurant is open to hotel guests as well as outsiders and has a separate entrance from the road. You can order through room service and the waiters will get food in the rooms. Like most other hotels in the hill town, Fairmont too offers few other standard services including transportation, arrangement of tours, doctors on call, laundry etc. There is a library as well. If you bring your own vehicle, the hotel provides a limited car park in front. Check out time is 12 noon. Overall Fairmont is a nice clean hotel in its category and very conveniently located. 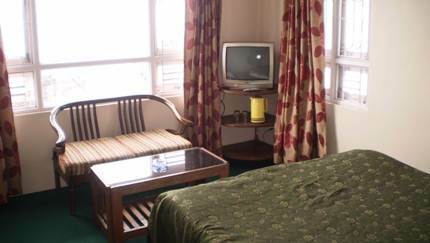 You can get Darjeeling Tourism Card and directly book this hotel. The card entitles you to great discount in this hotel and also at many well known restaurants, bars, shops, tours, transporters etc in Darjeeling giving you all-round benefits. While booking directly using Darjeeling Tourism Card, use the contact information given below. 10, Gandhi Road, Darjeeling 734101, India. Many thanks for the information provided in your article on Darjeeling tour. Booked hotel Fairmont as per your suggestion and had an wonderful experience of watching Mountain peaks from hotel window. As regards taxi fare and eating joint, your advice was simply fantastic. I have visited Darjeeling during 1st week of June, just before the agitation started. Dear Raj, Thank you so much for giving complete details of Darjeeling on your blog. I am grateful to you for helping me to know about the hotels also. here I am sharing my experience at hotel fairmont. A memorable stay depends on where you put up and Hotel Fairmont provides you one of the best ambience. It was more like a home stay as the manager (Mr. Jeff Mistry) who is also the son of the owner is very courteous and took care of each and every issue of ours. His evergreen smile and behaviour makes you feel that for him how important his guests are. The staffs were very polite and very courteous. Mr. Jeff granted my wish gladly to get a panoramic view of Darjeeling from the terrace of his hotel. What else you can expect from the management who takes every pain to fulfill and honor your wish. Location wise the hotel is situated at Gandhi road which is a great advantage for travelers who wanted to explore Darjeeling by walking. The chowrasta n mall road is a total 10 mins brisk walking from the hotel. I had booked a 3 bedded room in advance and Mr. Jeff was kind enough to provide me a room on the 2nd floor as requested earlier. Cleanliness was of top grade as we entered the room no. 111 on the second floor. The room and the bathroom were spacious. They provided 24 hr running hot water which is a very major advantage and I am pretty sure that you won't get this facility of getting hot water for 24 hrs in all hotels. The room has a large window from where the peak was visible. Room rent was affordable. In fact what they charge you is much lower than what they gave. Rooms were very clean and the staffs used to maintain the cleanliness every day after we went for sightseeing. The bed linen and the towels were changed on daily basis. It was a delight seeing the room properly arranged when we came back each day. Although the hotel doesn't have an in-house restaurant but they compensate that by taking an extra pain by providing us breakfast and tea from nearby food shops in our room only. It's helpful specially when it's raining outside. Although they usually took a bit more time to provide the morning tea but it was acceptable as the other amenities they provide were excellent. All the big restaurants and shops are nearby so you won't face any issue in case you want to have food outside hotel. They provide Aqua guard purified water and the administration takes notice of these things on a prompt basis so that the guest doesn't receive the normal running water. In case they see that the drinking water is not being given from aqua guard then they scold their staffs for not being honest. I am telling this incident because in hotels generally you won't get such commitment from the Owner or even manager. Mr. Jeff gave some useful tips for local sightseeing and he also arranged the car for us. He is a man with sheer commitment for his guests. On our first day, our driver who took us for sightseeing and at Darjeeling ropeway he asked me for a "waiting charge" for which I enquired Mr. Jeff over the phone and he gave a hard time to the driver for asking us about the charge. The level of honesty and commitment towards his words was simply commendable as we had booked the car for the whole day and here Mr. Jeff proved that money is not everything. It's the service that matters the most. He is professional but he never compromises with his morals and principles. On the 2nd day Mr. Jeff gave us his own vehicle and driver for the sightseeing of Pashupati Market (Indo- Nepal Border) and Jorpokhri. Although the vehicle was booked from 1pm to 5 pm but due to bad weather Mr. Jeff asked us to board the cab at 10 am only and he dint charge a single extra penny for providing us the vehicle 3 hrs earlier. I am very grateful to him for taking so much care of us like his own family. Overall it was a very nice and peaceful stay in Hotel Fairmont. I am happy to get a second home in Darjeeling.